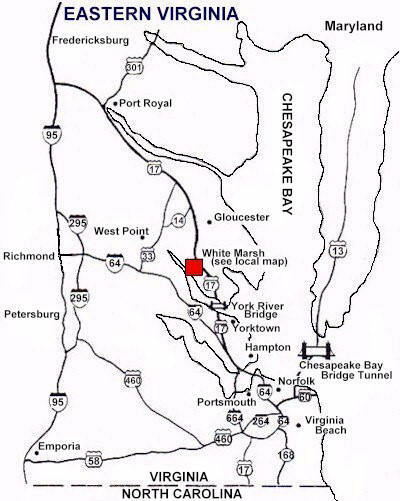 Click Here To Find Us on "Yahoo Maps"
Travel south on Route-95 toward Fredericksburg. Take the third Fredericksburg exit which is marked Route-1 Massaponax. At the light at the bottom of the exit road, turn right. At the second stoplight, turn left onto Route-17. Drive on Route-17 south about 30 minutes through the light at Port Royal. Another 30-minutes travel will bring you to Tappahannock. Route-17 is the main thoroughfare of the town. Continue driving south approximately another hour. Signs will indicate a turn for Gloucester Courthouse. Do not turn. Travel another 5-miles to the traffic light at the intersection of Route-17 and Route-614. A Little Sue Convenience Store / Exxon Gas Station is on the right hand corner. See local directions from here on local White Marsh map below. Take Route-64 west toward Williamsburg. Go through the Hampton Roads Bridge Tunnel and travel about 20 minutes. You will come to exit 250B for Fort Eustis, Yorktown. At the bottom of the ramp, go left at light. Drive for one block to next intersection. At that light, go right onto Ft. Eustis Blvd (Route-105E). Go 3-miles to light and the intersection with Route-17 (McDonald’s on left, shopping center straight) – turn left going Route-17 north. After about 5 minutes, you will cross Coleman Bridge over the York River (toll $2, but free on returning). Travel about 7 miles to the traffic light at White Marsh (intersection of Route-17 and Route-614). There will be a WaWa Convenience Store on the left hand corner. Turn left onto Route-614 and proceed as per the local directions on map below. Arriving from the North or South on U.S. 17, turn onto Route 614 for 1 mile. Turn left onto Route 633 for 1/2 mile. 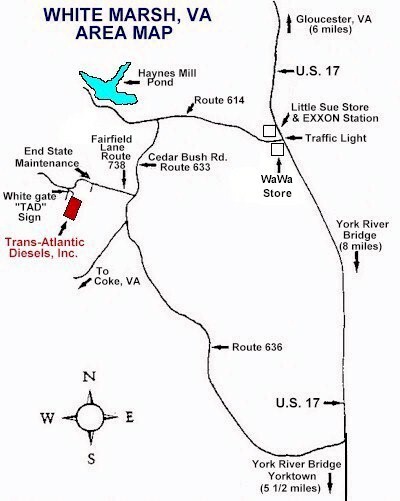 Turn right onto Route 738 (Fairfield Lane) for 1/4 mile. Where the State Maintained Road ends and road narrows, proceed straight ahead and around a left hand curve until arriving at white gate. Enter the gate and immediately turn left.